Sometimes you buy a book based on an interesting synopsis or even a beautiful cover; a recommendation from a friend maybe. Then again, every so often a book crops up that you know absolutely nothing about but you read it anyway just because it’s within easy reach of your oh-so-lazy self. 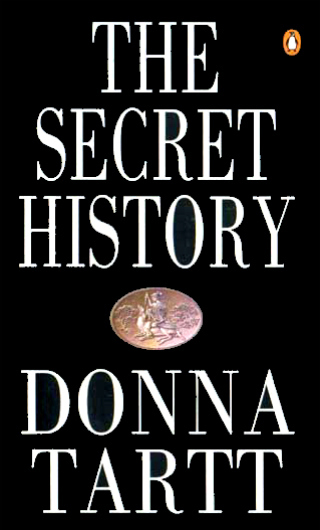 The Secret History was just such a book. Charlotte recommended it to me, but only in passing and in the vaguest of ways. The blurb tells you absolutely nothing and the cover is hardly descriptive. And yet this modern classic ended up being one of the best written and enigmatic books I’ve read this year. Plot summary: Under the influence of their charismatic classics professor, a group of clever, eccentric misfits at an elite New England college discover a way of thinking and living that is a world away from the humdrum existence of their contemporaries. But when they go beyond the boundaries of normal morality their lives are changed profoundly and forever. Hardly specific. Yet I do think that’s an asset for The Secret History. With some books you need to begin with an understanding of the general direction of the story, but here I loved just settling back for the journey. I didn’t know what The Point was, the tone or even what genre it was going to end up (and that’s still under dispute), but that meant every development and twist was a complete and absolute surprise. The prologue threw me a little in that respect. I suppose I was expecting something very academic and perhaps relationship-related, and the very dramatic and adventure-type-novel tone of the prologue threw me a little. In all honesty I nearly didn’t continue with the book at all. However, I’ve stated time and time again that the first thing I’ll do as Prime Minister of the United Kingdom is to completely outlaw both epilogues and prologues alike, and I think that my point in that respect is proved with The Secret History. The book itself is certainly not even remotely adventure-ish. It has quite a slow plot with not a great deal of action, but you feel the twists in the plot like a punch to the stomach. The story is built up ever-so-slowly with a lot of discussion about classic philosophers and morality that occasionally went over my head. It’s not to a book to pick up when you’re sleepy as it would be almost impossible to follow. I listened, a bit affronted by his tone. To do what he asked was tantamount to my transferring entirely out of Hampden College into his own little academy of ancient Greek, student body five, six including me. ‘All my classes with you?’ I said. Don’t let that put you off though. The tension and the atmosphere is almost tangible, and without doubt the best thing about this novel. I put down the book and still felt the pressure to keep hold of all the dark secrets I’d been told in confidence through reading. It’s a masterpiece of storytelling, it really is. The various relationships, secrets, plots and betrayals loosely demonstrate the Greek tragedies which are, after all, the theme of the book. It’s not something I picked up upon until I sat down afterwards to consider exactly why The Secret History works so well, but I eventually clicked onto the way it shadows the very concept under discussion. It’s actually kind of perfect. The characters aren’t exactly likeable; in fact, they’re the very opposite. Then again, the Greek heroes were hardly the epitome of charm and goodness. Except when they transformed into swans and raped women, obviously. It adds to the story to a certain extent though. It adds a certain distance between the characters and the reader, much as though you were studying their actions in an academic context. All in all, I love the formal but clever tone and the aura of darkness that surrounds the story. There are lots of twists and secret revelations, but it’s the stunning prose that really makes The Secret History what it is. It does require you to take your time while reading it, but I promise you that it’s worth every second. Read a much more eloquent review at The Lit Addicted Brit. Pssh to "more eloquent" – I *always* think you do a much better job of coming across as really loving a book. I absolutely agree with you about the ties to Greek tragedies – loose but so, so clever. And the writing! Brilliant. Seriously, though, I so adored this book and I love how both you and my Dad texted me at the end and were like "OMG – *****!" Except for the fact that he is an older man and texts like one, your texts were so similar that it was the best. And now I know for definite that you both loved it as much as me!! I kind of agree with you on prologues (particularly this prologue) but I do like a good epilogue (particularly this epilogue)…don't get me wrong, I would still totally vote for you as Prime Minister but I'd sort of secretly be hoping for an epilogue-accepting coalition. Incidentally, I was going to be The Goldfinch the other day but when Laura and me found it in Waterstones I realised that it is HUGE! I mean really – have you seen the size of it?! I'm sure it's excellent and the reviews of it that I've seen are all glowing but I'm not so keen on breaking my wrists to enjoy it. Hello, ebook! Yeah, I just HAD to text you at the end. It was really odd and it didn't quite fit with the rest of it, but almost in a good way? Not like I read it IN JUNE or anything, so excuse my lapse of memory. I swear next year I'm so definitely staying on top of my reviews. Sorry for making fun (not very cleverly) of your typo, but it was a fun head image 🙂 I did see the size of it, but only when I ambled past it without really looking. I don't even know what it's about and only know it exists because it was stamped on a padded envelope from Harper (or somewhere) last week. To be fair to it, it does LOOK dull. Tiny, dense font and a drab cover? Bah. You've read it twice already though? Now that's impressive! Hmm. This could totally be done. People could join up and then we take it in turns to pick the next book to be read, from any genre of your choice, but then obviously other members could opt out if they don't want to read it. And then making a post about that book could be entirely optional, but we could have a join e-mail going round where we could talk about it as a conversation, not just a series of posts! Anyway, instantly voting you for Prime Minister but only if you give epilogues the occasional benefit of the doubt (that phrase suddenly looks really wrong to me, hey ho) as I really liked the one in Harry Potter! Kind of. It was nice to see where everybody was in the future at the very least. I read this AND The Little Friend waaay before blogging, so predictably I can't remember much about the plot, but just the feeling of OMG YES that Donna Tartt generally gives me in my brain now means I know that they were both excellent. This is a really helpful comment, I realise, but I've been saving this post all week cause I can't comment on my phone, so I HAD to say something about it! Glad you loved it, anyway.